They flit, they flutter, they fly. They make it darn difficult to get a picture of them. To my mind there is probably no creature on this earth so photogenic as the butterfly. Their bold markings, their grace, their usually colourful landing strips combine for the perfect photo op. The only problem is to try and keep them still long enough to get the shot. I actually achieved it several years ago during a late summer visit to a lakeshore cottage. Though, to be honest, I'm not sure I really had that much to do with it. 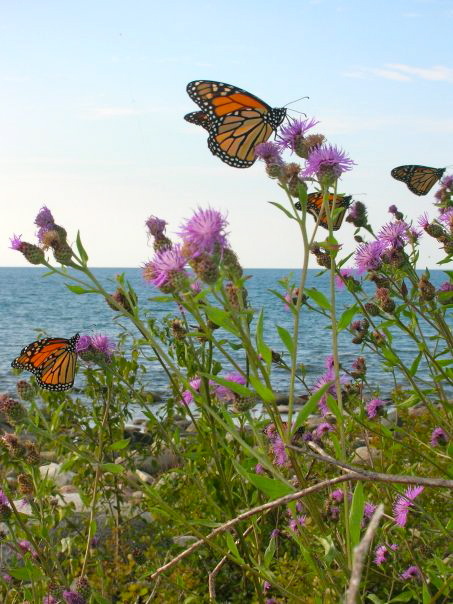 Sitting on the beach near some Scotch thistles, I noticed a Monarch butterfly dancing around me. Now, a few months earlier a friend's daughter had passed away tragically and the grieving family had found representation in these beautiful insects and comfort in their presence. I was therefore so enchanted by my little guest that it took some time before I saw she wasn't alone. At least half a dozen of her friends were playfully skipping from one bloom to another all around me. Realizing I was probably going to miss my chance, I nonetheless darted back to the cottage to grab my camera, only to find on my return that the majority had settled quite picturesquely. To have me further recognizing that there are occurrences and occasions in this world that we'll never understand, they all remained posed while I happily clicked away from a number of angles. It is easily one of my favourite pictures. Certainly there are ways it could have been better, but for a spur of the moment shot, the results were pretty darn cool. Apparently others agreed, too, as I entered one of the photos in a contest for amateur photographers and it won. I take little credit, however. I've always felt there was an angel on my shoulder that day.